At the height of the Vietnam War the US military had come to fully appreciate the role which could be played by so-called "gun ships". 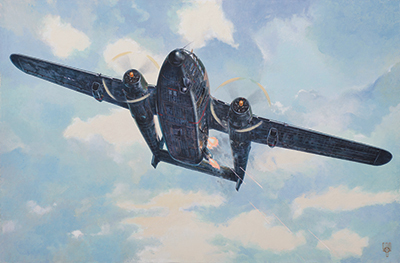 The first experience of its application by the AC-47 Spooky proved that this kind of weapon could be very effective, but this machine was a rebuild of an out-of-production type, with limited flying characteristics. In 1967 the Fairchild Hiller company as part of the Combat Hornet program received an order for the conversion of the C-119 transport into a combat air support machine. Although the C-119, like the veteran C-47, was not a modern design, its size and its two powerful engines allowed the installation of more effective equipment. The first 26 AC-119G Shadow machines, a contract for the construction of which was signed in 1968, were in essence "large AC-47s". The same range of armament was installed on board, while the C-119's big cargo compartment enabled the fitting of big analog calculators, which provided the crew with data for accurate firing. In May 1968, the first machines were delivered to the Air Force and were immediately sent on to units for working up. One year on, a more advanced modification appeared, the AC-119K, which despite apparent similarity with its predecessor, was in fact a very different machine. Under the wings were installed additional J-85-17 turbojets, and rather than four blade motors, some machines sported three blade Hamilton Standard propellers. The biggest changes to the machine were hidden inside. To the observing systems was added an AN / AAD-4 infrared seeker, which allowed the plane to operate round-the-clock, and a RLS AN / APQ-136 radar system, which was able to track moving ground targets. Also, the weapons array was considerably strengthened - in addition to the standard four MXU-450/A modules, two blocks of the six-barreled 20 mm caliber Vulcan guns were installed. In early 1969, the first recycled AC-119Ks were transferred to combat units for training, but problems with the reliability of the infrared systems prevented these new aircraft being immediately sent to Vietnam. Only in the fall of that year was the first AC-119K flown to Phan Rang air base, and full combat use began in the first weeks of 1970. In February the crews of these aircraft received the official Stinger call sign. During 1970 and 1971, these machines were used quite effectively in the sky of Vietnam and Laos. During this time AC-119K destroyed about a thousand ground targets and destroyed more than 3,000 of the enemy forces. In late 1971 the AC-119K was relocated to Thailand, but again their targets were objects in Vietnam and Laos. In 1972 most AC-119Ks were transferred to the newly formed Republic of Vietnam Air Force, but American crews continued to fly them. With the advent of the more powerful AC-130, the role of the AC-119K, along with its predecessor the AC-119G began to decline significantly, until in the mid-1970s, these machines are completely removed from service. Some of the aircraft were converted back to transports again, and others were sent for scrapping.